For those who may not know, I found myself managing the Brooklyn band Radio 4 just around the point I made the move out of Brooklyn and up to the Catskills, in the summer of 2005. Life is full of such ironic twists and turns and you have to learn to accept how things have a habit of happening at odd times or you’ll never be happy with your lot. Working with the band in 2006 has taken me to Britain thrice, France twice, Germany, Greece and Brazil. Oh, and Texas. It’s taken me to New York City often enough that I don’t feel like I fully moved out of the place. Most of the time, though, it’s had me dealing by broadband and phone with people in a dozen different time zones from my lovely little cottage in Phoenicia (where, incidentally, I’m one of three of the local school’s dads in this line of work – not counting the musicians, writers, producers and performers!) There was a point earlier this year where I was talking the to group’s European tour manager, who was at his own place in the Norfolk countryside, and we then began bouncing files back and forth, all of this for free being that we were using Skype, and we were both remarking how happy we were with the rural view outside our window, and I thought: Isn’t this a bizarre world mankind has created for itself? There was another time earlier in the year, which I documented here on the front page, where I was in the town of Hudson, picked up a new mix from a British producer off of his iDisk, transferred it to the iPod and was then playing it in the car, all within a few hours of him finishing it off on the other side of the Atlantic. And let’s not get started on the pros and cons of the Blackberry. 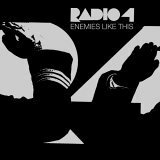 Enemies Like This by Radio 4. More info here. We learned to trust audience reactions. Radio 4 spent the second half of 2006 almost entirely on the road: they toured Europe no less than four times, America twice, and we all shared a wonderfully hectic 36 hours in Brazil. They shared stages with New Order, Franz Ferdinand, the Yeah Yeah Yeahs, Placebo, The Rapture, Art Brut, Belle and Sebastian, !! 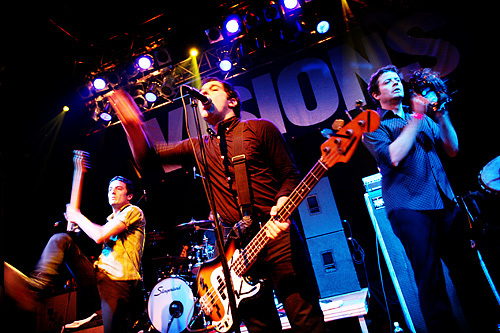 !, The Bravery and TV On The Radio. They appeared on the TV shows Last Call With Carson Daly in the States, on Rockpalast in Germany, and on Le Culture Club in France among others. They recorded sessions for BBC’s Radio2, 6 Music, for XFM, and for key American stations KEXP, WOXY and WFMU. (You can see videos and hear radio sessions at this page.) A five-year old B-side was used for a Nike World Cup commercial (the one featuring England’s disastrous ‘Boy Wonder’ Wayne Rooney), a new song was used in an American TV show as a last minute replacement for The Who, and main man Anthony Roman’s year was rendered complete when his comments on ‘Know Your Rights’ were plastered across a page in The Clash singles box set. The DFA remix of ‘Dance To The Underground’ was featured on The DFA Remixes: Chapter 1, and DFA producer/LCD Soundsystem front man James Murphy even DJ’d guitarist Dave Milone’s birthday party. Radio 4 in their onstage element. Photo taken by Emma Svensson at Berlin’s Kesslerhaus in September 2006. Visit her gallery here. The DFA came to acclaim mixing Radio 4’s first real album, Gotham!, and though they don’t like remixing an act more than once, Murphy’s partner, Tim Goldsworthy, made an exception for the single ‘Packing Things Up On The Scene’ under his new guise The Loving Hand. His upbeat dance mixes were released as a 12” single (and for digital download) in October; his dub mixes have previously gone unheard. Until now. Starting today, and available until the new year, The Loving Hand Dub remix of Radio 4’s ‘Packing Things Up On The Scene’ is available for streaming and download. iJamming! is proud to be hosting the file. Just click the link below and help yourself. It’s a nine-and-a-half minute mix, so if you’re a little deterred by the large file, you can visit the group’s myspace page and download a smaller file with lower compression. (I.e. it will be of lower quality.) Any which way, enjoy. Radio 4 will be playing the Mercury Lounge in New York City this New Year’s Eve. You can learn more about and here more from the group here and here.